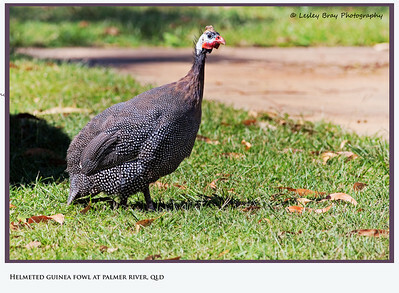 2 images - Helmeted Guinea Fowl. 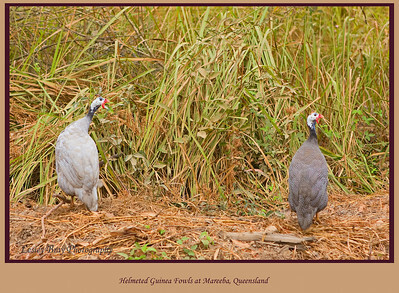 A pair of Helmeted Guinea Fowls, Numida meleagris, scampering for cover beside the road as we passed on our way to Mareeba Wetlands. Mareeba, Atherton Tableland, North Queensland, Australia. Photographed July 2010 - © 2010 Lesley Bray Photography - All Rights Reserved. Do not remove my signature from this image. Sharing only with credit please. Helmeted Guinea Fowl, Numida meleagris, at Palmer River, Cape York, Queensland, Australia. Photographed May 2013 - © 2013 Lesley Bray Photography - All Rights Reserved. Do not remove my signature from this image. Sharing only with credit please. Helmeted Guinea Fowl, Numida meleagris, at Palmer River, Cape York, Queensland, Australia. Photographed May 2013 - © 2013 Lesley Bray Photography - All Rights Reserved.